If you follow me on Instagram or Twitter you already know what has been occupying us for the past couple of weeks: we’re building our own home. I say home instead of house because, well, it’s not a house. It’s a yurt! In the coming weeks I’ll do a little series about this experience: how we came to this point, the building process (including lots of sewing! ), and of course what my sewing space will look like in the end. Let’s start with how we got the idea in the first place. Up until October ’13 we’ve lived in a normal house like everyone else. Then we gave it up to start travelling Europe for an indefinite time, with our campervan/firetruck. The goal was not only travelling itself (we didn’t have any plans that went further than ‘South Europe’), but to discover new ways of living, and new places to live. We hoped we’d find a place nice enough to stay and settle but that didn’t happen. Not because we didn’t find nice places, but because we found too many nice places. If you have nothing to tie you to a place, there are going to be too many options. We’ve always been interested in alternative homes, like trailers, tiny houses, and yurts. We feel very comfortable in small spaces. We find that the more space we have, the more we tend to fill it up with stuff we don’t need and that weighs us down over time. When we decided to go WWOOFing one of the goals was to learn or experience new ways of living. This led us to Nicholas and Noella, who lived in a yurt in La Marche, Italy. With them we got to experience life in a yurt, and we loved it. The round space, the closeness to nature, going back to basics and the mobility of the structure. It seems like a big step to go from a brick house with central heating to a yurt that’s basically made of wood, fabric and sheeps wool and has no toilet. For us it actually feels like we’re moving up, since we’ve lived in a campervan (on and off) for more than a year now. A yurt matches our needs at the moment: we don’t know where we’ll settle yet but until we do, we’d really like to have a home of our own. 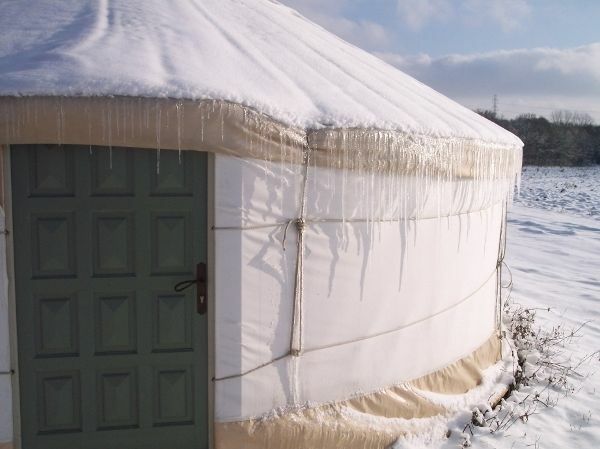 A yurt can be set up in half a day, and taken down in the same amount of time. You don’t need a concrete foundation, just a relatively flat surface. We can easily move it if we need to or want to explore other regions. We still had some months of travel ahead of us when we got excited about yurts but our dreams didn’t change. We didn’t want to go back to the Netherlands though. Lucky for us, Stef’s parents have a holiday house in France with a big backyard, and they agreed we could put up our yurt there. So, the first thing we did when we came back was research how to make this happen. Well, not the first thing, our first and foremost priority was to finally launch the Jade skirt. 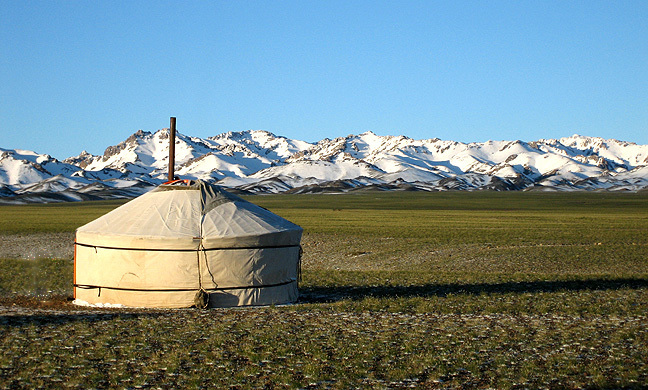 At first we looked into traditional yurts, since they were financially a wiser choice. They are also beautifully painted and made of only natural materials. They have some downsides though: they’re not made for wet climates, and they are not built for tall Europeans. So we decided to go with a modern yurt with materials that can take the wet seasons and are sourced locally. And we found a place where we could build the yurt ourselves, under guidance of professionals. This was perfect for us: doing most of the work ourselves meant that we could keep the costs down and learn new skills at the same time. So we set out in our truck once again to build our own home. And with this little backstory I leave you! Next time I’ll be talking about the building process and all the sewing that was involved. I’m gathering inspiration on my Yurt Life Pinterest board if you want to see how beautiful a yurt can be. You are an inspiration. Yes I’ve been thinking about doing what you guys are doing. Don’t know yet what Nils thinks about this…. Cool, where would you want to start? Travelling or living in something else than a brick house? Oh good lord, can I just set up a little yurt next door and sew along with you? (Of course, this has nothing to do with the fact that I’m living in a major Northeastern U.S. city with winter coming, while shoveling my child through 7th grade…) I totally agree with living in a smaller space. You really think about how much stuff you bring in the house. (With the exception of fabric. There’s always room for that.) In the summer I have a sewing studio in the outbuilding of our beach cottage, and right now I’m dreaming of that. Whaaaat? So cool. A yurt. It’s just so fun to say! I’ve only stayed in a yurt … ummm… twice? Once? I should be able to remember that better… it does seem like a very welcoming space! But as it snows outside, it also sounds like a cold place. How do you make it airtight? I don’t think it will ever be fully airtight, but it gets pretty close with the way you overlap the insulation. And the wood stove should keep it nice and toasty :) Because it’s all fabric and wool it doesn’t need as much time to heat up as brick walls do. thanks for your interesting background informations. At the moment i like to be settled in a “normal” house. With a big garden. Hi! For me the yurt is a hybrid of camping and a normal house. And we’ll have a big garden for sure! But you’re lucky to have one too, the city where we lived big gardens were not plenty. I love your choice of home! I’m currently living in a small borrowed house but will soon be moving to a tiny sailboat of 26ft. 20 years ago people were cruising the world in small sailboats with no problem at all, but nowdays everybody says it can’t be done if boat is not at least 40ft long and one must have a watermaker, satellite phone and such. It’s sad that we have developed such needy and depending mentality that is taking us farther away from nature…At the end all the stuff that you own starts owning you. Living with less gives you more freedom, but only few understand this in this crazy materialism driven society. Wishing you amazing times in your sweet new home and a short and warm winter! Wow, a sailboat! One of our plans was living on a boat :) Do you have travel plans? I totally agree on living with less. Getting rid of our stuff was very liberating! Wow! What fun. I live in a straw bale house that my husband and I built. It looks like a normal house though. I lived in a tent when I was much younger for a little while and spent summers in a wall tent. That is so cool! A straw bale house is actually our next plan. We need to find a piece of land first though. We hopen dat jullie het nog goed naar je zin hebben in de Morvan. Tip: Kijk nu en dan eens op de website van Club du Morvan. Op de homepage werd melding gemaakt van een firma die goedkope eco-chalets bouwt. Altijd interessant om even te kijken. Wij komen op 26 april weer naar de Morvan. Hi Lisa. I didn’t realize that you were building the yurt! I’m so impressed. I am so curious to see your sewing space when you have it up and running. We are toying with the idea of sailing with out friends next year. I’m not sure how to keep Sew House Seven going on a boat so I need any alternative living inspiration I can get.